Whether you are planning to celebrate Oktoberfest by dressing in traditional German costume or are creating a German outfit for a Halloween party, lederhosen are fun to wear and easy to make yourself at home. These are leather or suede shorts with suspenders traditionally worn by Austrian and German men. Use items you already have in your closet or scour thrift shops to find suitable items of clothing to adapt. Wear an open-necked white shirt with a collar. If time and skill allows, embroider some patterns across the top or add lace-up ties to the open neck. Team the shirt with brown shorts. Traditional lederhosen are made from brown suede. Use brown pants in the most suitable fabric you can find such as leather, suede, faux suede, corduroy or cloth. Cut the pants off just above the knee and then hem. 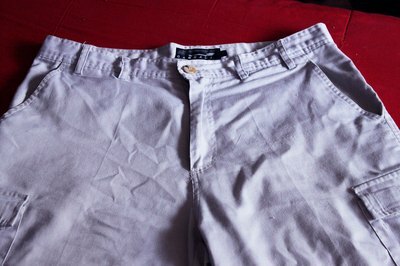 Use the fabric you cut off to make a square panel to sew over the front of the pants. Add four large buttons, two at each side. Hold the pants in place with suspenders. Brown or decorative suspenders work well. 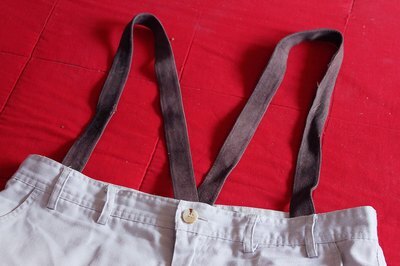 Sew or glue a fabric panel across the front joining the suspenders together. Use material cut from the pants. Hem it with iron-on hemming and add decorative ribbon trim. 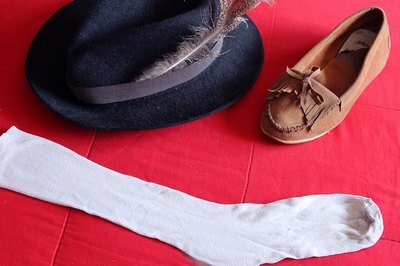 Wear long, light-colored socks and leather boots or shoes. Add a hat such as a traditional German conical-shaped hat, or wear a straw hat with a feather. 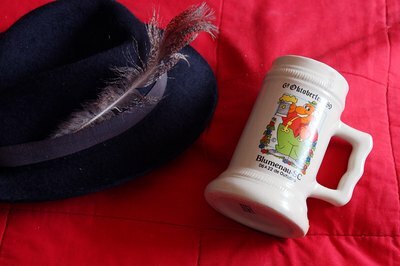 Carry a beer stein. 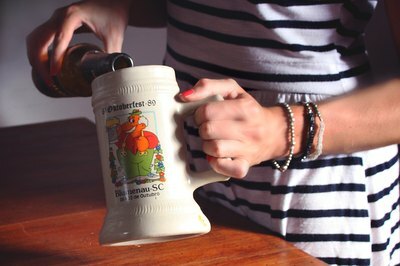 Remember that steins hold a lot of beer, so don't refill it too often. German costumes work well for a couple. German frauleins can dress in a dirndl and wear braids in her hair.